In the summer of 2002, the emerald ash borer (EAB) which is native to Asia, was discovered in southeastern Michigan. Chances are it arrived via an airplane or ship cargo holding area, silently nestled in solid wood crate packaging material. And the consequences have been brutal, with over 70 million ash trees in North America lost due to EAB infestation. Today, the S-shaped emerald ash borer larvae which feasts on the inner bark of ash trees, can be found in 32 states and many Canadian provinces. 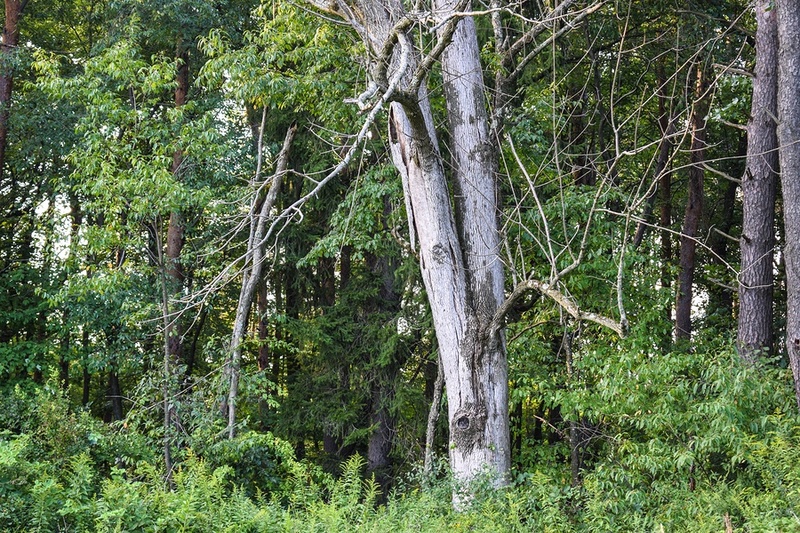 In an attempt to limit the spread of the tree disease and the migration of the beetle from the eastern portion of the US, the USDA has put in place regulatory guidelines and fines to prevent ash tree firewood, logs, or processed planks from leaving quarantined areas. The resulting cost to nursery operators, property owners, municipalities, and ash wood product manufacturers continues to rise over hundreds of millions of dollars. Unfortunately, the spread of this devastating ecological disease cannot be stopped, and it is estimated that within 20 years the ash tree will be extinct from the North American landscape. Trees infected with EAB will start dying from the top branches down, as the internal vessels that carry water out to the branches are eaten away. Once an ash tree loses over 50% of its canopy, it is not treatable, according to scientific consensus. Tree owners may first notice an increase in woodpecker activity, bark splitting vertically due to tunneling, and branches that sprout from the bottom of the tree. Adult beetles will leave a D-shaped hole in the tree bark when exiting. An untreated ash tree within the quarantined states will die within 2-5 years following infestation. While there are insecticides that may treat this infection - it only applies to trees that are somewhat healthy and the right product must be applied in a very specific manner. To prevent the spread of the disease, it is always recommended to dismantle, remove, and burn any tree infected with emerald ash borer beetles. Dead ash trees pose a danger of fallen limbs, especially during ice or wind storms. Once the insides or the root system of an ash tree are eaten, the tree is more likely to fall unexpected across electrical power lines or onto homes and buildings causing severe injury or death. Ash trees are commonly located in front of homes as sidewalk and street landscaping. This means both the homeowner and the municipality have a stake in the responsibility and cost of safely removing these trees. Since chemical treatments are expensive, tree demolition is often the solution used to remove infected trees, and replacement trees are planted along residential streets. Most municipalities have instigated a program of mass removal of ash trees from the community. The work is slow and tedious as the same manual labor procedures are used. Workers are elevated to tree tops along with a rope and pulley system to lower large branches and trunk sections to the ground. The SENNEBOGEN 718M E series is an innovator in the tree services industry and has the potential to save many lives. Working among trees that are infested with EAB exposes the tree service industry to the unseen danger of trees that are eaten from the inside - leaving them brittle and prone to fall at any time. The 718M E series is able to meet the scale of these tree removal operations by cutting and stacking trees 10 times faster than conventional methods. The 718M E series is purpose-built tree handling equipment with multiple attachments for cutting, grabbing, shearing, and collecting trees. The machine is controlled by a single operator stationed inside a climate controlled cab with full visibility. Its telescoping boom has lifting capacity of 12,000 lbs when fully extended vertically (48 feet reach) and 3,700 lbs when fully extended horizontally (43 fee reach),to effortlessly handle the largest and tallest ash trees. This machine is designed for agile movement and responsive handling. For street side or natural landscapes, the fast outrigger is quickly repositioned for non-stop operations even at night or in the rain. 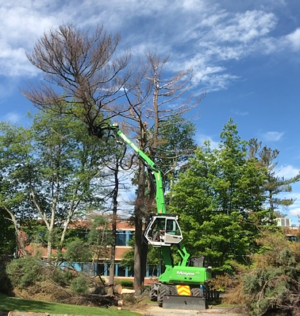 During mass ash tree removal operations, airborne tree chips, debris and bark pose no problems for the 718M E series. The HydroClean 3 micron filtration system continuously self-cleans the hydraulics system at 99.5% efficiency, removing water and particulates. The 718M E series maintenance is done from the ground with all components easily accessible. The complete machine is controlled hydraulically without the need for special software to troubleshoot. Its compact footprint allows easy transport and off road tires, reinforced axles, and a robust undercarriage means the 718M E series can go from pavement to bush to woodland without hesitation. Our team at SENNEBOGEN is dedicated to strong customer service, from our world class training facility to our replacement parts inventory with over 98% fill rate same day and 250 service locations. For our customers, we provide free training in advanced instruction to their in-house technicians. For a quick response to emerald ash borer disease infestations across North America, we have experienced equipment distributors in the United States, Canada, and Mexico. 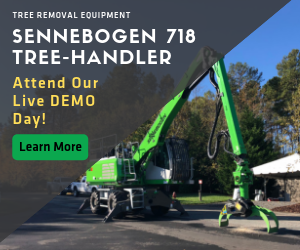 If you want to see what this equipment is all about - we invite you to attend one of our upcoming Demo Days held in Stanley, NC. Here, you will have the opportunity to ask questions, meet industry experts, as well as talk to the operator and other business owners that are looking to scale their business by introducing cutting-edge technology.